Ferg Family Adventures: A Pretty Eventful Five on Friday! A Pretty Eventful Five on Friday! Hey everyone! Sorry for the radio silence over here. Long story short, my trackpad on my laptop stopped working, so my computer's been at the Apple store for the last few days. Anyways, lots to talk about, so let's get to it! 1. We moved Ella to her big girl bed on Sunday. I wish I could tell you it has been all rainbows and butterflies, but I honestly feel like I am trapped in some newborn sleep-deprived hell. The first night Trav had to sleep in the bed with her, and in subsequent nights, we had to lay on the floor until she fell asleep. She also keeps waking up in the middle of night, freaking out that Mommy and Daddy are gone, and will not fall back asleep until we are in her room, laying on her floor again. As soon as we get up to leave, within 5 minutes, she wakes up and realizes we are gone and freaks out again! About to lose my mind yesterday, I asked for advice from the moms Facebook group I am in...they had some really good tips! So last night, I used some of them: loaded up Ella's bed with stuffed animals, gave her a nightlight, put a picture of me and Trav next to her bed (this cracks me up, but they swore it works! ), and then we left her door open with a baby gate in front. It worked!!! Well, kind of. She went right to sleep (!!!!) but woke up around 1 AM. We got her back to bed pretty quickly though (without either of us laying on the floor or having to stay in her room). She also woke up at 5:45, but we were able to get her back to sleep even quicker that time. So all in all, things are looking up!!! Hopefully this upward trend continues! 2. In better Ella news, she had her first gymnastics class this week! I just about died over the ponytail. She loved it. Her favorite things were following the other (3 year old) class around, the balance beam, and trying to build a tower with the blocks in the foam pit. Good times all around. 3. 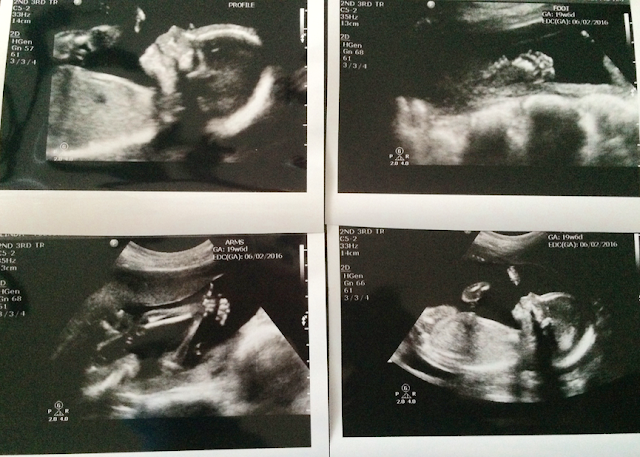 Also this week was Baby Ferg 2's anatomy scan! We double- and triple-confirmed it was still a boy. He looks great and is developing right on track! 4. Oh! We sold our house!!!! 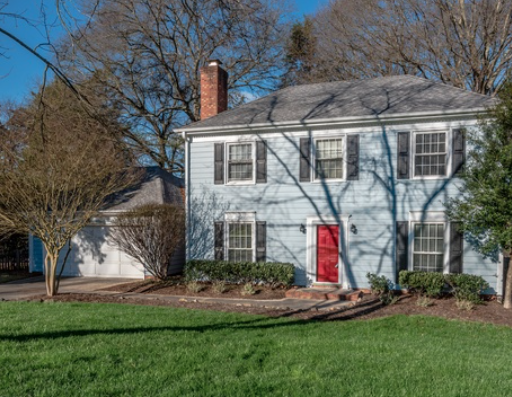 We just put it on the market last Thursday, and by Monday night (and 25+ showings!) we had a great offer that we accepted! Inspection is this morning, so we'll be praying all goes smoothly! 5. Ella's party planning is under way!!! Does anyone know where to find Lilly Pulitzer craft supplies (scrapbook paper, ribbon, etc.)?! Here's a little flashback that popped up on my Timehop today...can't believe this photo shoot was a year ago! Oh my gosh. Moving to the toddler bed is tough. I'm glad its getting better. Honestly..what would we do without moms groups?! So much good advice! We used the "Door Monkey Door Lock" that I found on amazon and it's worked awesome. The door is cracked open, but he can't come out. Yay for selling your house and all of the other exciting things going on for y'all this week. I LOVE that little ponytail that Ella rocked! Congrats on selling the house! Love that photo of Ella from last year, so cute. Hope things start looking up for you in the sleep department, having no sleep is torture. Dropping by from the Five on Friday link-up! Ella is adorable and that ponytail is fabulous!! Yay for better sleep and yay for selling your house!! That is wonderful news!! Yay for selling your house. I love Ella's bedding. Also, there is a seller on Etsy called "ItsBriana" (might be 2 n's) that sells Lilly ribbon in a ton of brings and by the yard so you don't have to order a million of only one print. I'm sure you can find scrapbook paper on Etsy too. Yay for selling your house! We had a Lilly Pulitzer-themed 1st birthday party for our little girl. I had a lot of luck on Etsy sourcing things. That being said--I'm weird and I have saved ALL the Lilly catalogs since years ago and use them to craft. Our gal has two hearts and her first initial on her wall that have a smorgasboard of various Lilly prints I modg-podg'd on using cut-outs from catalogs. I also used Lilly P bags from the store (yup, save these too for this purpose) and made signs for her birthday this way. Good luck! My friend ordered a lot of Lilly printed stuff off of Etsy for her daughter's first birthday party last year!